Food drive at the Islamic Center of Raleigh honors the three slain Muslims who were victims of an armed man three years ago in Chapel Hill. RALEIGH, North Carolina (WTVD) -- A very busy group spent hours Saturday receiving, sorting and collecting food donations at the Islamic Center of Raleigh. It's part of the ongoing campaign to honor Deah Barakat, his wife Yusor and her sister Razan, the three slain Muslims who were victims of an armed man three years ago in Chapel Hill. The gathering attracts more participants each year. "I think it's evolved to something much bigger than us. It's amazing to see all these people coming together for a common cause," said Shadi Sadi of the Interfaith Food Drive. The cause, feeding the hungry, is what brought a huge crowd Saturday to the Islamic Center's parking lot. Some people may have heard about the three victims on TV. Other's like Ellen Maynard, have relatives who knew one or more of the victims. "I've been following that sad event," said Maynard, "and I've been doing whatever I can to support this very friendly, community-minded group." One member of that diverse group, Barry Schwartz of Jewish Family Services agrees. Sadi is happy to see the diverse group of volunteers willing to spend part of their Saturday encouraging others to support this charity. 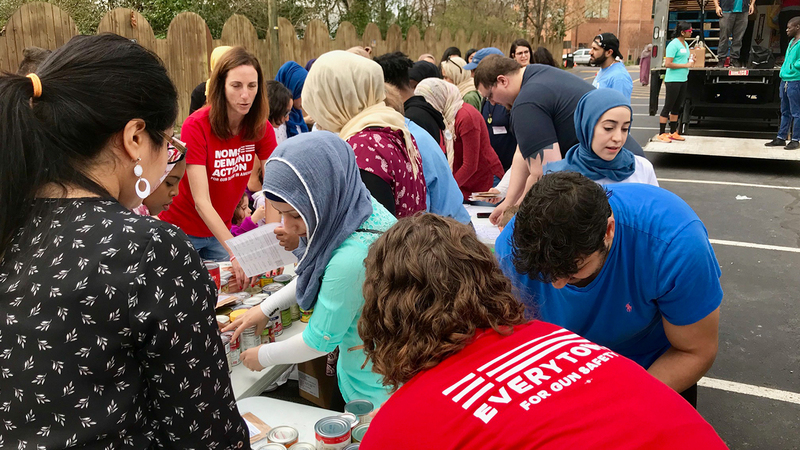 He said participants include "the NC State School of Design, where Razan was a student, Pullen Memorial Baptist Church, and Raleigh-Cary Jewish Family Services," several young Scouts, and advocates for stronger laws regulating guns. They're motivated to really make a difference in 2018, with everyone affected by the recent massacre in Florida on the minds of many participants in Raleigh. "Now we have 17 more people that their family members are at home, broken," Sadi said. "How can we break this cycle?" "It's not rocket science," said Maynard, who told us elected leaders haven't done enough to protect citizens from people who use firearms to harm others. "We're not gonna solve it by arming teachers in the school." For now, she and others focus their energy on collecting donations for the Food Bank of Central and Eastern North Carolina.